In 1961, Theatre Director Joan Littlewood and architect Cedric Price conceived the Fun Palace as a ‘laboratory of fun’, ‘a university of the streets’. It was to be a temporary and movable home to the arts and sciences that would welcome children and adults alike. This wasn’t possible in 1961; it’s very possible now. 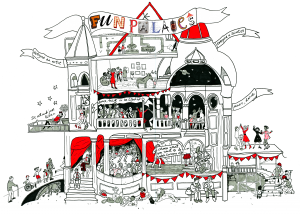 On the 3rd and 4th October 2015, there will be a second series of Fun Palaces across the UK and beyond – 130 at the last count. Each will be unique, self-generating, self-supporting, utterly local. Ours is made in conjunction with artists based in Southwark, the Latin American Multicultural Group, The Friends of Burgess Park and the London Wildlife Trust. We are bringing in elements of Black History Month and The Big Draw. We are truly local, utterly global, fun and palatial. There’s only a week to go and you can still get on with creating one yourself: www.funpalaces.co.uk. The books have all gone but the ideas are still here. Tagged arts & science, Fun Palaces, Joan LIttlewood, Just Jones &, justRMJ, Stella Duffy, university of the streets, Wells Way Pop Up. Bookmark the permalink.